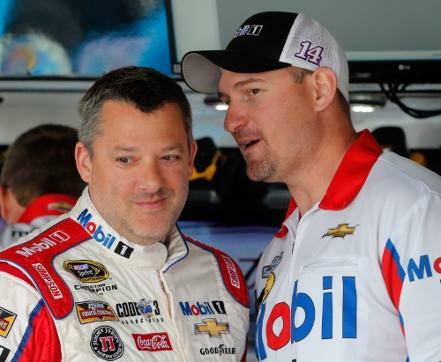 joined Stewart-Haas Racing (SHR) owner/driver #14 Tony Stewart and Team Chevy, taking over for 2011 Sprint Cup Champion-winning crew chief Darian Grubb. Addington and Stewart had previous worked together at Joe Gibbs Racing and together they won three times in 2012. Stewart got injured and Mark Martin was brought in to finish the season. Before Stewart's Injury; he had a win. 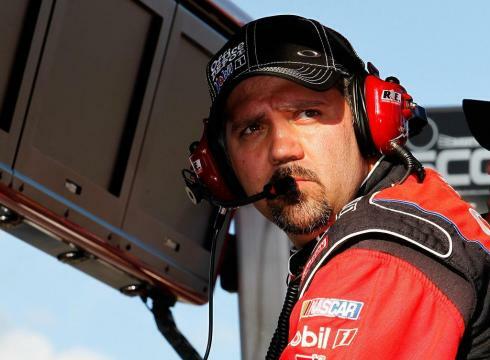 Addington was relieved of his duties as crew chief of the 14 on November 19th, 2013, and he moved to HScott Racing to work with Jason Allgaier for 2014 & 2015. 2016 Saw Clint Bowyer take over the car from Allgaier as Addington remained on as the crew chief. They had a dismal season and at the end of the year Scott closed down his race operation leaving Addington looking for a job. SO far Addington has won 20 times with the Major events of the Southern 500 (2010) and the Coke 600 (2010). They finished 13th in the 2018 points. After such a disappointing season, Danny Stockman has been brought in to lead Austin in 2019. Stockman has worked with Austin before. He led Dillon in the Truck series in 2010 and 2011; winning the Championship in 2011. Then in 2012 and 2013 he paired with Dillon in the Xfinity series. They won the championship there in 2013. Not sure of Alexander's plans as of early 2019. So far he has spent his whole career as a crew chief at Richard Childress Racing. times. He remained with the team after it was purchased by Geoffrey Bodine with seven races to go in the season. From 1994 through 1996 he led Bodine;s efforts. and together they claimed four wins. 1997 saw Michael Kranefuss hired Andrews to lead the efforts of Jeremy Mayfield. He worked with Mayfield ye full season of 1997-1998; winning once. After 11 races of the 1999 he joined Dale Earnhardt, Inc. with driver Steve Park Earning the #1 Pennzoil Chevrolet team for 2000 and 2001. They would claim two wins. But mid-season of 2001 Park would get injured and Kenny Wallace would be brought in to finish the season. Wallace raced the first four races of 2002, before Park returned. Andrews would head up Parks efforts for 21 races when Andrews left to go to work with Jeff Burton for team owner Jack Roush. He remained with Burton in 2003 and the first four races of the following year before he was replaced by Bob Osborne. He would land in the Xfinity Series working with Kasey Kahne. In 2005 he was back in the Cup Series leading Kyle Petty in the Petty Enterprises stable. With sic races to go in the 2006 season Petty Enterprises made a move and sent Ahbrews to their other team car with Bobby Labonte at the controls. Andrews led Labonte for the first 22 races of 2007 with only one Top 10 finish. He was seriously injured in a fall in his shop on August 15, 2007, several days after he was released as Labonte's crew and replaced by Doug Randolph. He was hired by Michael Waltrip Racing to be Michael Waltrip's crew chief for the 2008 season but that only lasted three races. He was out of racing until 2012 when he returned as the crew chief for Scott Speed for two races. Since then he has not been active as a crew chief. For his career he claimed one Cup Championship with Alan Kulwicki in 1992. 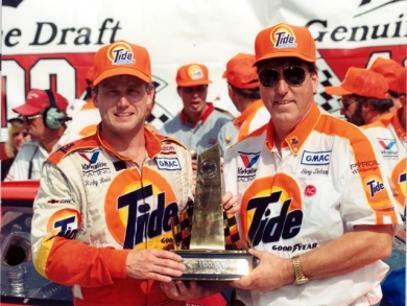 He led his drivers to 12 wins; Kulwicki (5); Geoff Bodine (4); Jeremy Mayfield (1_; and Steve Park (2). saw more of the same as the team was struggling to make ends meet. Baldwin attempted to make a return to full time racing in 2012 with David Reutimann serving as driver for 18 races. Dave Blaney was hired to run the full season in 2013 but is was disappointing as Blaney failed to post a single Top 10 finish. Regan Smith drove for Baldwin in 2016 and did manage a Top 5 finish and additional Top 10. In 2017 Baldwins team as once again a start-a.d-park team for the most part. 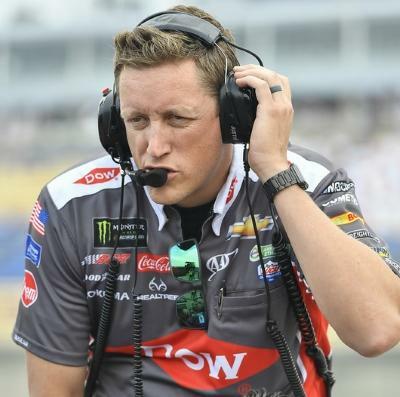 As 2018 kicks off Baldwin is the team majority owner of Tommy Baldwin Racing and Competition Director of Premium Motorsports, the latter for whom he also serves as crew chief of the No. 15 car in the Monster Energy NASCAR Cup Series. His father, Tom Baldwin, was a former champion NASCAR modified driver. Baldwin himself briefly pursued a racing career before becoming a mechanic. Seth Barbour - ?/?/? - first broke into NASCAR as an Xfinity series crew chief for Roush Fenway Racing, and their driver Chris Buescher in 2013. He worked with six different drivers that season and in 2014 became the full time crew chief for Ryan Reed. They had a season best finish of fourth at Daytona. 2015 saw the pair win the season opening Daytona race; the first for both driver and crew chief. But the season went poorly and after 20 races the decision was made to swap crew chiefs. Barbour left go to lead Bubba Wallace; while Chad Norris was brought in to finish out the season with Reed. Barbour stayed with Wallace all of 2016 the pair posted three top five finishes; including a second at Dover. He moved to work for owner Bob Jenkins and Front Row Motorsports after he was brought in mid-season of 2017 to lead driver Landon Cassill. He was switched from leading Cassill, moving over to head up the efforts of David Ragan in 2018. They had a best finish of sixth; their only top ten of the year. The pair is going to remain together for 2019.
college. Barker has since overcome his injuries to be a respected crew chief and one of NASCAR's most brilliant minds. 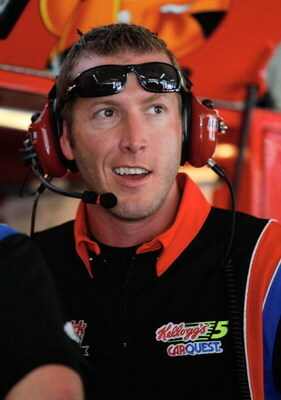 Barker got his start as a crew chief in 2001 working for Bill Davis Racing and is paired with driver Scott Winner in 2001 and 2002 in the Xfinity Series. 2002 was a good year for the pair as Wimmer would win four times and finish third in the Xfinity points. The following season he would be hired by Doug Bawel for call the shots for Dave Blaney and Barker moved up to the Cup Series. Baker would be replaced by Shane Wilson for 2004 and Barker was left looking for a job. He was hired by Gene Haas at the start of 2005 and called the shots for driver Mike Bliss. They would have two Top 10 finishes. For most of 2006, Barker was the crew chief for the #66 Haas CNC Racing Chevrolet driven by Jeff Green but was replaced by Harold Holly for the final five races. In 2006 he would lead Johnny Sauter for Haas but they could only manage to post one Top 5 finish. 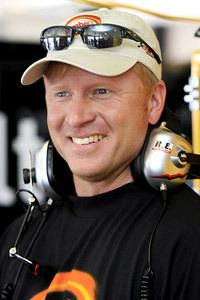 Harold Holly kicked off 2008 as crew chief for Scott Riggs, but was quickly replaced by Barker. The duo only had one Top 10 finish. On October 1, 2008, Michael Waltrip Racing announced that Barker would be the crew chief of the #55 NAPA Auto Parts Toyota driven by two-time Daytona 500 champion Michael Waltrip for the 2009 Cup Series season. In 2010 Barker moved to Germain Racing to head up the team for Casey Mears through 2016. In 2017 however Mears was dropped as a driver, and Ty Dillon was hired to fill his seat. The duo failed to have any finish better than 11th and posted 18 Top 20 finishes. 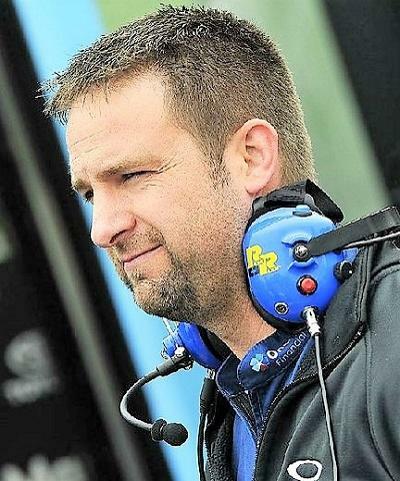 Matt Borland took over crew chief duties for Dillon in 2018, while Joe Gibbs Racing hired Barker to lead ARCA driver Riley Herbst. They had eight Top 5 finishes including two second place results while finishing third in the points. but Elliott had a bad crash at Talladega and broke his leg. The following season Elliott had a decent season as Beam led him to five Top 5 and 14 Top 10 finishes; with a second place at Michigan. In 1998 Beam was out of a job; but the following year he joined the Wood Brothers team and driver Elliott Sadler. Beam would lead Sadler for two seasons, but the team would have little success and Beam was cut lose before the end of the year. However as 2001 dawned, he would again have a job; working with owner Cal Wells and driver Ricky Craven. They won at Martinsville but after going win-less the next season he went to head up Jeff Greens efforts at Richard Childress Racing. 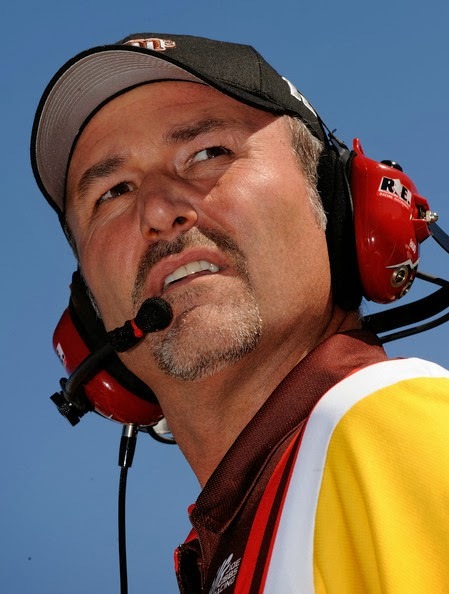 After 11 races at RCR; Childress made a move to try and shake up the team as he swapped Beam and Tony Gibson. Gibson was put with Green; and Beam assumed crew chief duties for Steve Park. The swap didn't produce and positive results and both drivers finished worse than 30th in the points. This would be the final season that Beam would have a full time job in the Cup Series. 2004 saw him call the shots for a total of 17 races with drivers Ricky Craven, Bobby Hamilton Jr and Kenny Wallace. He also headed up Hamilton Jr for 15 events in 2005. In 2006 Beam pulled double duty as he dropped down and he was the crew chief on both the Truck Series and the Xfinity Series. He worked with Mark Martin for seven races in the Xfinity Series; posting five Top 5's. In the Truck Series he guided Martin to six series wins in 14 starts. From 2007-2009 Beam was hired by Jack Roush to head up his drivers. Travis Kvapil was under the leadership of Bean in 2007. He won four races and finished fifth in the points. The next two years would see Beam lead Colin Braun. He would go win-less in 2008, but win once in 2009. Beam was moved to the Xfinity Series in 2010 and in just six starts in 2010 Beam led Carl Edwards to two wins. He paired with Edwards full time in 2011 and they had an amazing eight wins; but missed one race so he was not in the hunt for the Xfinity Championship. In 2012 Kyle Busch had an Xfinity Series team; and the ride was split between him and brother Kyle. Beam led the team and Kurt won the race at Richmond. In 2013 He was the crew chief for John Wes Townley driving for Red Horse racing in the NASCAR Truck Series. Townley posted seven Top 10 finishes and was 11th in the season points. Townley and Beam partnered up for 2014. Beam led Townley for seven Xfinity races and ten Truck Series races. He was only able to get one Top 10 finish. In 2018, Beam became president of GMS (Gallagher Motor Sports) and they placed a bid for the Charter of bankrupt BK Racing in the summer of 2018. They were looking to start a new Cup team; but their bid fell short. To this point in his career Beam had three Cup Series wins including the Southern 500. He had 11 Xfinity Series wins along with 11 Truck Series victories. different Childress teams. 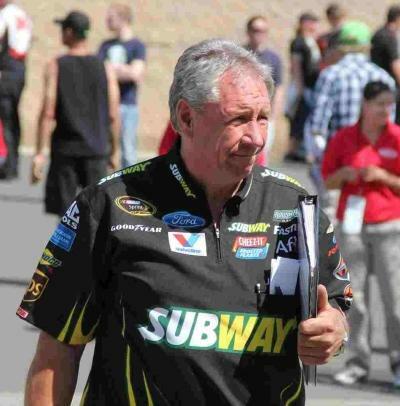 He was in charge of Harvicks team the first nine races; before he was shuffled over to head Casey Mears team. For the final four races of the season he would partner with Jeff Burton. The next year he stayed with Burton and although they didn't win; he did post two second place finishes; both coming at Dover. He led Burtons team for the first 19 races of 2011 before being replaced by Luke Lambert. He went to JTG Daugherty Racing at the start of 2012 to lead Bobby Labonte's race efforts. Once again after 19 races he would be replaced by Brian Burns; and go to work for Barny Visser at Furniture Row Racing working with Regan Smith. Before the season end Smith would be replaced by Kurt Busch. The following season he worked with Busch full time; they almost won twice and had 11 Top 5 finishes. Martin Truex replaced Busch for 2014 but the team had a serious reduction in performance only posting one Top 5 finish. Berries final two times atop the pit box would come in 2016; once with Kyle Busch and once with Truex. Berrier has complied eight wins in his career as a Cup crew chief all with Harvick. Major wins include Brickyard 400 in 2003 and the Daytona 500 in 2007. He has six wins in the Xfinity Series; also all with Harvick. Finally he has four wins with Johnny Sauter in the Truck Series. ANDREW "DREW" BLICKENSDERFER - ?/?/? - Blickensderfer began going to local drag strips to help drivers prepare their cars. He purchased a modified to race, but soon quit racing the car. "I really didn't want to be in the car," Blickensderfer said. "I think everybody has aspirations when they get in the sport of being a race car driver. I wanted to be a crew chief, make the calls, prepare the cars. Blickensderfer started as the rear tire change pit crew member and mechanic for Dale Earnhardt, Inc.'s #1 car. He spent a couple years in the Xfinity Series as crew chief for Danny O'Quinn and owner Jack Roush. He had one Top 5 finish. In 2007 he crew chiefed mostly for Matt Kenseth who drove the majority of races for Roush in the Xfinity Series and the pair collected two wins and 15 Top 5 finishes. He led Carl Edwards Xfinity runs in 2008. Edwards made 19 starts andwon on seven occasions, but finished second in the points. In 2009 Blickensderfer move to the Cup Series with Matt Kenseth. He won in his first race as a Cup crew chief in the 2009 Daytona 500. The paid also won another race that season. He started out the 2010 NASCAR season as Kenseth's crew chief for the Daytona 500, but was reassigned to Roush Fenway's research and development team after the race. He replaced Donnie Wingo as crew chief for the #60 Jack Roush owned, Fastenal Ford driven by Carl Edwards. They would win two times and have 13 Top 5 finishes with Edwards again finishing second in points. Blickensderfer again moved up to the Cup Series in 2011 with David Ragan as his driver. He almost won the Daytona 500 again as a crew chief and went on to win with Ragan at the 2011 Coke Zero 400, collecting his third win as a Cup Series crew chief. 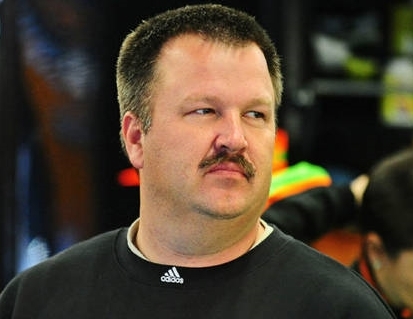 Blickensderfer moved to Richard Childress Racing in 2012 to be the crew chief for Jeff Burton. However, after the organization struggled as a whole, he resigned from the position after the TUMS Fast Relief 500, heading to Richard Petty Motorsports to crew chief for Marcos Ambrose. He would remain at Richard Petty Motorsports through 2017. He led Ambrose in a full time effort all of 2013 and 2014 and almost won on a couple occasions. He worked with Sam Hornish for 10 races with a best finish of sixth. He was the crew chief for Aric Almirola in 2017, but Almirola was injured and missed some races during the season. Darrell Wallace would fill in four of those events. Almirola posted three Top 5 finishes. For 2018 Almirola left Petty Motorsports to go to Stewart-Haas Racing. RPM hired Bubba Wallace to pilot the #43 car for 2018. They paired rookie Wallace with veteran crew chief Blickensderfer. They duo kicked off the season finishing second at the Daytona 500; but it would be the only Top 5 all season. From there it was pretty much downhill as Wallace was only able to add two more Top 10's during season. Better things are hoped for in 2019 as the rookie now has a year of experience under his belt. and remained through the transition to SHR in 2012. Borland had worked as a crew chief for 10 seasons in NASCAR before he was promoted to Vice President of Competition for Stewart Haas Racing. Borland was reunited with Newman, who was hired to drive the No. 39 Chevy. At the end of the season, Borland took over crew chief duties for Newman after Tony Gibson was aligned with Danica Patrick. Borland enjoyed a dual role of crew chief and technical director with Newman in 2013, and the pair won their 13th Cup race together at Indianapolis Motor Speedway, Newman’s home track. Newman moved to Richard Childress Racing for the 2014 season and after Newman’s departure, Borland had delved into the engineering end of SHR and shifted his concentration to Haas' Formula 1 project. In 2017 Borland decided he wanted to get back in the game and took over crew chief duties for Paul Menard at RCR. They had two Top 5 finishes. Menard left RCR at the end of the 2017 to drive for the Wood Brothers in 2018. Borland spent all of 2018 heading up the efforts of Ty Dillon at Germaine Racing after leaving Richard Childress when no driver was hired to fill the seat of the #27 car. Borland had lead the efforts of Paul Menard in the #27 in 2017. The whole season was a struggle as they didn't have a single Top 10 finish. The best results was an eleventh place results twice (Phoenix, Talladega). They had 19 finishes inside the Top 20 and that seemed to be where they raced the entire season. Germaine Racing has a technical alliance with Richard Childress Racing and that team struggled all of 2018 also; so it's no surprise that Dillon also had a poor season. Things are scheduled to remain the same for 2019. Germaine Racing is moving their shop from Mooresville NC out to be near RCRC so they can have a closer working relationship starting in 2019.
would leave togo to work for car owner Raymond Beadle for the 1983 season with Tim Richmond behind the wheel. He would be there for two season; winning once each year. Brewer would find himself back at Junior Johnson Racing back in 1985 and would remain there through 1992. He started working as head of Neil Bonnett's team. Bonnett was driving a second car for Johnson and was Darrell Waltrip's team mate. Bonnett won twice in 1985 and finished fourth in the points. The following season the pair would win once; but slip to 14th in the points. Terry Labonte was brought on board after Bonnett left the team siting he felt like he was "playing second fiddle" to Waltrip's team. Labonte and Brewer paired together for three seasons posting four wins and 28 Top 5 finishes. In 1990 Labonte departed and went to drive the Skoal car for Leo Jackson. Geoff Bodine was brought in to fill his seat. He won three times that season and added another win with Brewer in 1991. 1992 saw a 'dream' combination come together in 1992. Johnson hired Bill Elliott to drive his machine. Johnson already had several championships as a car owner; and Elliott was already "Awesome Bill from Dawsonville". With Brewer sitting atop the pit box the season started strong with Elliott winning for of the first five races. He built up a huge points lead before the wheels started to fall off. With six races left in the season Elliott had a 154 point lead. At Dover, late in the race, Brewer wanted to change two tires on their final pit stop. Johnson over ruled him and called for four tires. As Johnson said later, " We were leading the race a lap ahead or something. Tim wanted to change two tires, and I wanted to change four. When I put four tires on it, it didn't run as good as it did when it had the four wore-out tires. I don't know what happened to the car, but we were coming out of the turn when [race winner Ricky Rudd] got the flag. Three more laps, we would have caught him. It was my fault. But the damage had been done. The next race at Martinsville, the team experienced a blown engine (30th). At North Wilkesboro, Elliott was eight laps down at the checkered flag (28th). At Charlotte, a track bar mount broke (31st) leaving Elliott a scant 39 points ahead of Davey Allison. They seemed to rebound at Rockingham finishing fourth; but a 31st place finish the next to last race at Phoenix left Elliott 40 points behind Allison. But a multi-car crash with about 75 laps to go took out Allison; leaving Elliott and Alan Kulwicki to battle for the Championship. Elliott won the race; but Kulwicki edged out Elliott to take the Championship. Kulwicki would lead 103 laps to Elliott's 102; that one lap swung the five bonus points from Elliott to Kulwicki giving him the Championship. Johnson stated later that his decision at Dover could have cost the team the Championship. Losing out on the series crown was bad enough, but according to Johnson, trouble had erupted in the pits earlier that cold afternoon. "Four of the Budweiser people from Atlanta had come down there, thinking we were going to win the race," Johnson said. "Tim was over there, getting them out of our pits when Bill didn't run that other lap (so he led the most laps). It's what I fired him over ... not looking after his business." Johnson and Brewer remain deeply divided to this day over that incident and won't even talk about it publicly. This season wins with Elliott would be his last as a crew chief. So for 1993 Brewer went to Bill Davis Racing to work with Bobby Labonte. They only manager to post six Top 10 finishes. 1994 saw Brewer virtually without a job as he would head up the effort of Robby Gordon for one race and one race for Geoff Brabham. 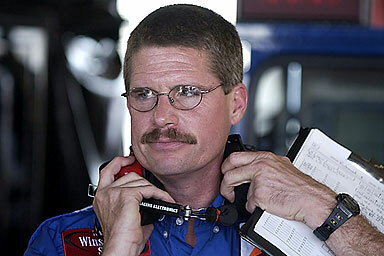 1995 would see Michael Kranefuss hire Brewer for a full season to lead John Andretti. They had a seasons best fourth place finish and only had five top 10 finishes. Brewer was let go after 17 races with Andretti in 1996. He would kick off the following season working with Sterling Marlin. They would finish fifth in the Daytona 500; but a series of poor finishes afterwards led to Brewer being replaced Robert Larkins. Geoff Bodine would hire Brewer to lead his tea that he was owner / driver of for the rest of the year. They posted one Top 5 and three Top 10's in ten races. 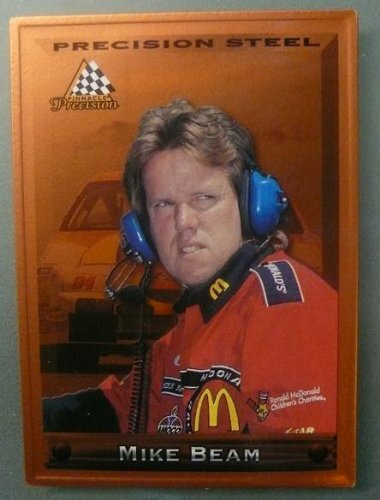 From 1999-2004 he was only on the pit box for a total of 32 races. He led drivers like Jimmy Spencer, Johnny Sauter and Mike Wallace. He only was able to get one Top 10 as it came with Wallace at Daytona in 2001. His last start was at Bristol; working for car owner Larry McClure with Spencer at the wheel. The team would finish 31st. In 2005 Brewer did have three starts in the Xfinity Series. His last came for driver Paul Wolfe (future crew chief for Brad Keselowski). In his career he had 706 Cup Series starts and won 53 times. Major wins include: Southern 500 (1978 and 1982,) and Cup Series Championship in 1978 and 1981.
up after only four races. In 1988 Bryant went to work for owner / driver Lake Speed. They would win at Darlington and have four Top 5 finishes. In 1989 Jimmy Means; another owner / driver would hire Bryant. They would have a season's best 12th place finish. Bryant would retire from the Cup Series at the end of the season. Bryant would lead his drivers to two career wins; both coming at Darlington. From 1990-1992 he would drop down to the Xfinity Series and would crew chief full time for Dave Rezendez (1990), Jeff Burton (1991) and Ricky Craven (1992). 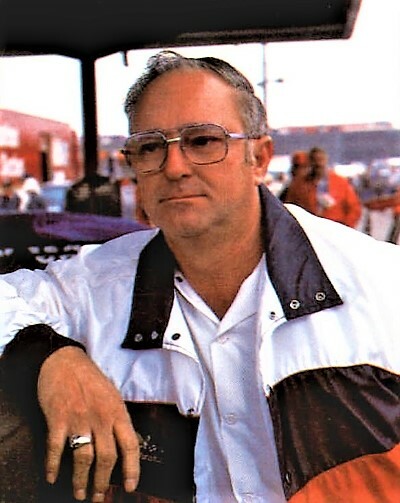 Burton would win one race in 1991 giving Bryant his only win as an Xfinity Series crew chief. How would only sit on top of the pit box a couple times per season through 1998. In 1999 he led Mark Green for a full season. Their best finish was a 10th in Atlanta. In 2000 he worked with driver Tony Roper for three races. Sadly Roper would be killed in a racing accident later in the season at Texas. post five more Top 5 finishes the rest of the season. They would finish 12th in the season points. Stewart-Haas Racing plans to keep the pair together for 2019.
lane five times in eleven starts; while Blaney would win once and Logano would go win-less. In just three short seasons, Bullins posted 21 wins in the Xfinity Series. Bullins would move to the Cup series in 2015. He lead the charge for Blaney that season; working for the Wood Brothers. The team was still only running part time at this point, so the duo just paired together for 16 events. As 2016 rolled around the Wood Brothers returned to racing full time. Blaney ran full time with Bullins at the helm. He posted three Top 5 finishes and ended up 20th in the points. 2017 would see Blaney and Bullins both get their first Cup win. It would come at Pocono. Blaney almost pulled off the win in the season opening Daytona 500 but was passed by Kurt Busch on the last lap; relegating Blaney to second. He would go on to finish ninth in that years points. For 2018 Blaney is moving to drive for Roger Penske and Bullins is following him there. But before leaving Bullins sat down and wrote the Woods a letter offering them his gratitude for taking in a young engineer nearly two decades ago: just parts of the letter read: - It’s funny how life works and the things that happen that lead you to where you wind up. When I sat down with Eddie and Len Wood at the picnic table in the old “new” shop in Stuart, VA in 1999 I could only dream that one day I’d be the crew chief of the 21. So as 2017 draws to a close, it’s not the end of the season I’m thinking about, it’s the beginnings. When those guys offered me a job that night it was the beginning for me. It got me started on a path that led to my ultimate goal of being a crew chief and for that I’m forever grateful. I can’t thank you enough for allowing me to be such a small part of the legacy of Wood Brothers. There is no more humbling feeling than for Leonard Wood to tell you he’s proud of your team after a good run. To every individual who played a role in the 21 car over the last three years, thank you for helping make our time together a success. Ryan and I have been very blessed to have the opportunity to begin our Cup careers in the shadows of such history. As we all head for new beginnings, I wish continued success to everyone at Wood Brothers Racing and will always be thankful for the beginnings you all provided for me. When Ryan Blaney was hired to go drive for Roger Penske in 2018, Jeremy Bullins went with him. After the duo posted a win in 2017, they went looking for better things in 2018. The season started off well and saw them post five races inside the top ten in the first seven races. and the other two finishes inside the top 16. They repeatedly posted finishes between seventh and 16th; but finally broke through and claimed a win at Charlotte on the new Roval. Jimmie Johnson and Martin Truex tangled in the final turn while racing for the lead; and Blaney was there to step in and grab the win. After the win, the seasons final seven races only saw the pair post two Top 10 finishes and end up tenth in the points. Bullins and Blaney will be back in the #12 car in 2019 for Team Penske. twelvth. 2018 was a great season for Allgaier and Burdett. They combined for five wins, including one at Indianapolis. They advanced through the first two rounds easily; but a 38th and a 24th place finishes in round three eliminated them for any shot at the title. The two plan to be together in 2019 still looking for that Championship. Penske hired Carter to work with Rusty Wallace for the 2004 and 2005 seasons. Carter would get his first win in 2004 with Wallace at the wheel. 2005 saw the team go win-less; but they would have eight Top 5 finishes and finish in eighth place in the points. Carter called the shots for Bill Elliott in five events in 2006; but the following year he was hired full time by Jack Roush to sit on top of the pit box and call the shots for Jamie McMurray. He would win at Daytona that season in the 400 mile race. 2008 saw the team go win-less; but he did have four Top 5 and 11 Top 10 finishes. In 2009 Carter was on the move again landing at Yates Racing paired with driver Paul Menard. It was a disappointment as Menard would only post a best finish of 13th. This would be Carter's last season as a full time crew chief. His career was winding down as in 2010 he led Brendan Gaughan in one Xfinity Series race, and in 2011 he led Steven Wallace in one Cup race and various drivers in a total of eight Xfinity series events. For his career he claimed two Cup wins and 19 Top 5's. with Gant and they would claim nine wins over that span; including the 1984 Southern 500. Gant would be injured in a hard crash and Morgan Shepherd would drive for him in five races. Gant would leave to go drive for Jackson Brothers Racing and Rick Mast was hired to take his place. The team ran just 13 races that season posting only one Top 10. 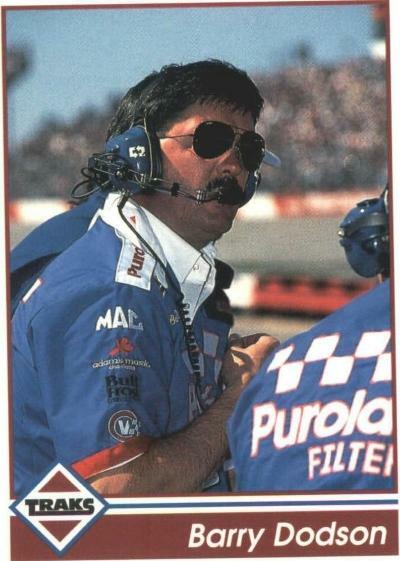 1991 would be Carters last full time season as a crew chief. He would start his own team and hire Jimmy Spencer as driver. Spencer had a season best third place finish and also had six Top 10 finishes. Spencer would start six races in 1992 and did not qualify for four events. Travis would continue to field Cup Series teams through 2003; but he would hire others to be his crew chiefs. He did serve as crew chief for four races in 1999 for Darrell Waltrip with no success. For his career as a crew chief he would have 11 wins; including the Daytona 500 and Southern 500. He also claimed the Cup Championship with Benny Parsons and had his drivers finish inside the Top 5 in points on eight occasions. had a rough season in 2011, finishing in the Top 5 only once. After Reutimann went win-less in 2011 the driver was released by MWR, to be replaced by Mark Martin and one of Childers' lifelong friends, Brian Vickers. At this point in his career, Martin had cut back to just racing part-time so the two shared the driving duties. They had four Top 5 finishes. The following season saw the same line up; with Martin and Vickers sharing the ride. The highlight of the season was when Vickers won at Loudon, NH beating out Kyle Busch by 1/2 second. 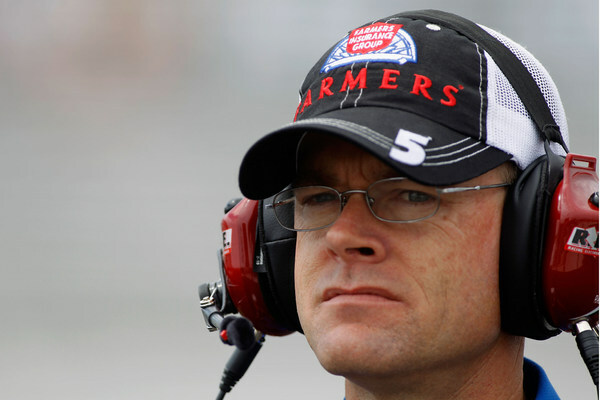 On August 23, 2013, despite the Loudon win, Childers announced that he was leaving MWR to become Kevin Harvick's crew chief at Stewart-Haas Racing in 2014. Childers was released from his crew chief duties by MWR following the 2013 Irwin Tools Night Race, but remained under contract for the remainder of the season. In 2014 Childers left Waltrip Racing to go to work for Stewart-Haas Racing. He would be paired with driver Kevin Harvick and they would have immediate success. In their first year together, they would win five times and claim the 2014 Cup Series Championship. 2015 would be almost as good as they grabbed three wins. The final race of the season saw a battle between Harvick and Kyle Busch. Busch would win the race and Harvick would finish second; losing the Championship by one point. 2016 was another good year for the pair as they would win on four occasions but only finish eighth in points. 2017 again saw Harvick in a battle for the Championship. He would win twice and finish third in the points. For 2018 Childers was set to once again lead Harvick on another Championship quest; and he lead Harvick to a great season. The pairing compiled eight wins and made it to the final race at Homestead with a shot to win the Championship. Harvick led 58 laps in the race, but the cars performance fell off with 100 laps to go and he ended up finishing third in the race and in the points. To date Childers accomplishments include: 25 wins; among them the Coke 600 win (2009) and Southern 500 (2014), and the 2014 Cup Championship. three more wins in 1995 and finishes sixth in points; again having a consistent year posting 14 Top 5 finishes. Their uncanny consistency landed them the 1996 Cup championship with only two wins; but would have an astonishing 21 Top 5 finishes among them seven second place finishes. In their four years together, Labonte and DeHart forged eight victories before DeHart departed in 1997 to form his own business, building race cars. DeHart rejoined Hendrick and driver Terry Labonte in 2000 for two more season, but they never showed the magic from before; posting only a best finish of second at Richmond in 2000; while he combined for only four Top 5 finishes over that two year span.. Over the next two seasons, DeHart only headed up a driver on nine occasions; recording a best finish of 24th with Kyle Busch in 2004. In 2007, it was announced that DeHart would join Ginn Racing operation (formerly MB2 Motorsports) as director of shop operations. On July 25, 2007, Ginn Racing announced it had merged with Dale Earnhardt, Inc. and DEI employees assumed the major positions and DeHart was let go. For his career DeHart had 10 wins and the 1996 Championship. cheerleader. Both were killed in the prime of their lives by a senseless alcohol related accident. He came back for one race in 1995 leading Kyle Petty at Dover driving for Felix Sabates. Petty was starting 37th for the Miller Genuine Draft 500, and he was a long shot to win. The weather was dark and overcast before race time. So here was Dodson, sitting on the pit box, confused as confused could be when all of a sudden the clouds opened up. Dodson, being the religious man he is, began to pray. "Trey, Tia. I know it's asking a lot but can you just make us have a nice solid run, I would really appreciate it." Then, like in a movie, the clouds closed. Dodson wasn't sure what to make of his prayer, but it all started to make sense as the day would continue to unfold. A lap-one accident that caused 20 cars to wreck on Dover's newly paved concrete would slingshot Petty towards the front. It was on lap 232 that Kyle Petty would take the lead from Dale Earnhardt and never look back. Petty led 271 of the 500 laps at Dover that afternoon, dominating the event and making Dodson's prayer come true. Dodson has said he has never prayed to his children again, knowing that they are with him forever. It was Petty’s first victory in two years, the final Cup Series win for both him and Dodson. Dodson retired from Cup in 1995. In all Dodson was a crew chief for 15 season and had 19 wins. All but the final one (with Kyle Petty) was with Rusty Wallace. Three times he finished in the top five in points with the one Cup Championship. Dodson also achieved six wins with team owner Jim Smith and driver Mike Bliss in the NASCAR Camping World Truck Series from 1995-98. He was later hired as general manager when Wallace started his own team in what is now the NASCAR Xfinity Series. His final season as a crew chief in the Truck Series was 2007. 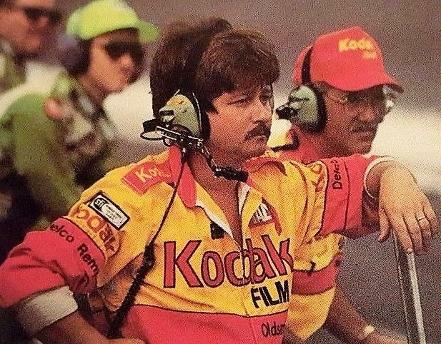 In 329 starts as a crew chief at NASCAR's top level, Dodson earned 19 victories; among them the 1990 World 600 and the 1989 Cup Series Championship. Dodson passed away unexpectedly in December 20, 2017 after a brief illness at the age of 64. DAVID ELENZ - 3/14/1981 - Elenz is from Gaylord MI and got involved in NASCAR in 2001. 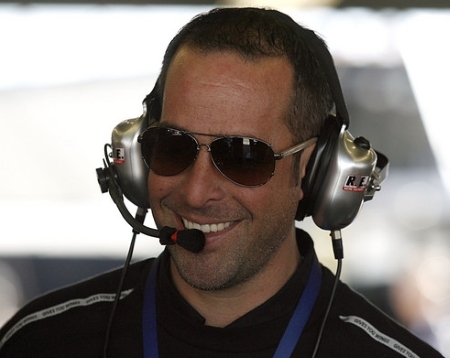 He is a graduate of Clemson University, Elenz began his motorsports career at Jasper Racing in 2001. While there, he formed a bond with JRM competition director Ryan Pemberton. The duo also worked together at Ginn Racing from 2003-07 and Red Bull Racing Team from 2009-11. At the latter, Elenz was a part of the organization’s first victory (Michigan 2009) and a berth in the 2009 Chase for the Cup as the lead engineer for Brian Vickers. In 2012, Elenz transitioned into an engineering role on Dale Earnhardt Jr.’s No. 88 team at Hendrick Motorsports. That season, the team went to Victory Lane at Michigan International Speedway and recorded 10 top-five and 21 top-10 finishes. Following an internal shuffle, Elenz moved to Jimmie Johnson’s No. 48 team in 2013. Working alongside crew chief Chad Knaus, Elenz helped Johnson earn his sixth career NASCAR Cup Series Championship in addition to ten victories during his two years on the #48 team. 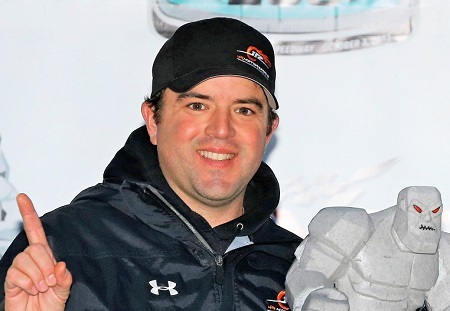 In 2015, Elenz took the next step in his professional career and joined JR Motorsports as a crew chief. A variety of drivers drove the "All Star" car as some of the "name" driver to wheel the car under Elenz leadership included Dale Earnhardt Jr Kasey Kahne and Kevin Harvick. Harvick posted two wins in the car that year and the car had eight Top 5 finishes overall. More of the same continued in 2016 as a bevy of drivers were at the controls. Earnhardt and Harvick were back as part time drivers and were joined by Chase Elliott, Clint Bowyer, Alex Bowman, and others. Earnhardt and Elliott claimed wins this season and overall the drivers posted eleven Top 5's and 23 Top 10's. In 2017 Elenz was put in charge of a full time team and he assumed the reins of William Byron's team. He duo claimed four wins and twelve Top five and 22 top ten finishes. They easily advanced to the final round of the Chase with a shot to win the Championship. Cole Custer easily handled the field that night as he led 182 of the 200 laps. Tyler Reddick was the only other driver to lead the race. Byron would finish third in the event; but was the best of the four drivers eligible for the Chase and won the first Championship for both Elenz and himself. 2018 saw Byron moved up to the Cup series full time, and Elenz was paired up with Tyler Reddick for 2018. Reddick edged out team mate Elliott Sadler by about two inches to win the season opening race at Daytona. The pair performed well all season long finishing second at Indianapolis and Texas. They easily advanced to the Chase portion of the season and advanced through each round with good finishes and by completing every lap in each race the final seven races of the season. When they rolled into Homestead to run for the Championship; Christopher and Bell and Cole Cueter were the favorites to grab the win. Custer had dominated the field in 2017 and no one would have been surprised if he did it again this year. Once again Custer had a dominate car and led 95 laps; As the final stage started; it would be a green flag run to the checkers. Reddick led briefly before Christopher Bell got by and looked to be the car to beat. BUt Bell would get loose and his car brushed the wall and upset it's handling. Reddick got by with 37 laps to go and no one was able to head him before the checkered hankie flew. Giving Reddick his first Xfinity Championship and Elenz his second in a row in two tries and JR Motorsports and their third Xfinity series Championship. For 2019 Tyler Reddick will be moving to the Cup series full time so it is expected Elenz will be partnered up with Rookie Noah Gragson. 1998 to 2002 before leaving to work with Chip Ganassi Racing. He was instrumental in guiding Casey Mears in his rookie year in 2003. He was crew chief for Casey for a further two years before taking Reed Sorenson through his inaugural Cup year in 2006. For the first part of 2008 he was again the crew chief for Reed Sorenson. After eight races Ganassi swapped his with Donnie Wingo; sending Wingo to lead Sorenson while Elledge would now lead Juan Pablo Montoya. After an additional eight races with Ganassi he would leave to work for owner Dietrich Mateschitz joining the Red Bull Racing Team with driver Scott Speed for nine races in 2008. Jimmy worked with Speed all of the 2009 season, and Started the 2010 season with Speed; but was switched back to wrench the car or Sorenson the remainder of that season. He was later released as crew chief when new driver, Kasey Kahne brought his own crew chief, Kenny Francis for the start of the 2011 season. Elledge returned to the Xfinity series to crew chief for Justin Allgaier in 2011 and 2012. They won once each season and finished third and sixth those two years. In 2013 he led Allgaier's two Cup starts, and four Cup starts for Kyle Larson. He last start as crew chief came in 2014 for driver Bobby Labonte. Of note - Jimmy was once married to Dale Earnhardt Sr daughter Kelly Earnhardt. ERNIE ELLIOTT - 7/25/1947 - was the crew chief for his Cup Championship winning driver, brother Bill Elliott. The Elliott clan also included bother Dan Elliott and they made their Cup series debut at Rockingham in 1976. The Elliott's struggled using underfunded equipment for the next five years. During Ernie's career as a crew chief; he only led the efforts of his brother Bill. Ernie was also the team engine builder and had always built strong power plants for their Fords. Aerodynamics was a major issue for Ford in the early 1980's as the old style box nosed cars struggled to push threw the air. Elliott Racing caught the eye of Harry Melling, and Melling bought the team and hooked up with sponsor Coors. When the new sleek nosed 1994 Ford were introduced, the horsepower Ernie had been able to create just to make the old box nosed Fords competitive quickly showed; and the new car was the class of the field. In 1994 Ernie led Bill to three wins, but in 1985 they teamed together to win a jaw dropping 11 events. Among those wins were the Daytona 500, Winston 500 and Southern 500. Winning three of the four major NASCAR races won the pair the Winston Million dollar bonus. 1986 saw the team win twice, and in 1987 they once again won the Daytona 500 plus five additional races. 1988 saw Ernie lead the team to the penultimate prize in NASCAR as they claimed the 1988 Cup Championship. Ernie's motors were very reliable as Bill finished every race but one that season, and claimed six wins including the Southern 500. During the 1987 Cup season Bill Elliott pushed Ernie's motors to a record that will probably never be broken. In Qualifying for the Daytona 500 Bill qualified his Ford on the pole at a record speed of 210.364. NASCAR was of the opinion the Fords were too fast; so before the race at Talladega, NASCAR changed the rules for the Fords to try and slow them down. Ernie went back to the shop to try and improve his motors, and when qualifying rolled around at Talladega, Bill once again put his car on the pole; this time at an all time record of 212.809. Ernie claimed three more wins in 1989, and one final win in 1991. Meanwhile Ernie had plans for his own son Casey Elliott. Growing up in a racing family, in 1993 at the age of 18 Casey was ready to move up to the NASCAR series. 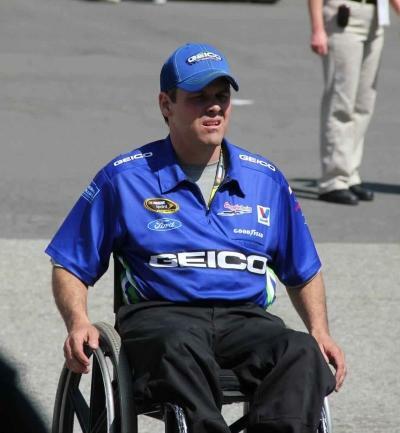 Casey was set to compete full time in the Xfinity series in 1994, but in December of 1993 it was discovered he had a cancerous growth in his leg. Surgery was performed to remove it, but the cancer returned and Casey passed away in January of 1996. Bill Elliott started his own team and called upon Ernie to be his crew chief for part of the season in 1999, and had six finishes in the top 14 for Ernie's 14 starts that season. For his career Ernie Elliott headed up the Elliott juggernaut for 33 of Bill's 44 Cup wins. They claimed two Daytona 500 wins (1985 and 1987), two Southern 500 wins (1985 and 1988), the Winston Million bonus, and the 1988 Championship. Also of note - in 1985 at Talladega Bill won the pole, but early in the race it looked like the motor blew up as smoke billowed out of the car. Bill got down to the inside, and no yellow flag flew. When they raised the hood the team discovered the power steering line had blown off, but the motor was still fine. They capped off the line, and Bill returned to the track just in front of the race leader almost TWO full laps in arrears. Ernie's power plant and his engineering abilities allowed Bill to catch up and RETAKE the lead with OUT benefit of a yellow. Bill retook the lead on lap 145, and the race's first yellow didn't fly until after lap 160. SO it was simply amazing and one of the greatest modern day feats in NASCAR history. four races but only missed two the rest of the season under his direction. The team started outside of the top 35 in points and had to race their way in to the first few races in 2006. In its second year the team did not miss a race in 2006. Roush Fenway Racing hired Erwin as the crew chief for the #16 Cup car driven by Greg Biffle in May, 2007. Erwin's first race with Biffle was at Dover International Speedway. Biffle started in the 10th position and finished sixth, his best finish in seven races. In September, his team went on to win at Kansas Speedway. Erwin and Biffle recorded two wins in 2008, their first full season together. The team made the chase for the second time in Biffle's career finishing the season third in the point standings. They went win-less in 2009, but still made the Chase and finished seventh. 2010 found them in victory lane twice and finish sixth in the Chase. After 18 races in the 2011 season Erwin was released, and replace by Matt Puccia. He was hired by Richard Petty Motorsports and lead AJ Allmendinger the remainder of the season. In 2012 He served a crew chief for Aric Almirola in the Cup series, and in 2013 was the lead man for Sam Hornish as he went down to the Xfinity series for Team Penske. From 2013-2017 he led various drivers who drove for Roger Penske in the Xfinity series. He claimed 12 wins during that period. For 2018 Erwin has been hired by the Wood Brothers to lead their new driver Paul Menard full time in the Cup Series Greg Irwin had spent 2017 working for Roger Penske and lead an Xfinity series team. It was Erwins first time atop the Cup pit box since 2014. The pair was only able to post one Top 5 finish and seven Top 10's. They failed to make the Chase and finished 19th in points. Erwin and Menard are expected to be back in 2019.
posted three Top fives. Eury moved over to work with Dale Earnhardt Jr in 2006 and the due won at Richmond. Eury, Jr. helped Dale Earnhardt, Jr. get into the Chase for the NASCAR Cup and challenge for the NASCAR Cup Championship; finishing fifth in 2006. 2007 would be a down year as they produced no wins and only five Top 5 finishes. In 2008, Earnhardt split from DEI (a business his father formed) and went to drive for Rick Hendrick. Eury went with him. They won at Michigan that season. After a poor showing in the 2009 Coca-Cola 600, some began to talk of Eury, Jr.'s possible firing; but was transferred to the R&D team on May 28, 2009. He was replaced by Lance McGrew. For 2010-2012 Eury worked in the Xfinity Series for owner Dale Earnhardt Jr. (JR Motorsports). He headed up the efforts of such drivers as Scott Wimmer, Kasey Kahne, Jamie McMurray, Aric Almirola and Danica Patrick. 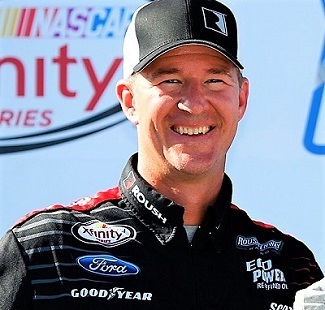 He claimed one win while in the Xfinity series; it came in 2010 with Dale Earnhardt Jr. On December 10, 2012, Eury was hired by Swan Racing (was Inception Motorsports) as crew chief for David Stremme in the Cup Series replacing Steven Lane. He held no crew chief position in any of NASCAR's top three series from 2014-2017. He was called upon to team with long time driver Danica Patrick as she made her final Cup start in the Daytona 500 in 2018.
worked with Brad Keselowski full time in 2008 and 2009 under the JR Motorsports banner. They posted six wins and finished third in the points both years. The following season Eury again worked for JR Motorsports but led a multitude of drivers; among they were: Aric Almirola, Jamie McMurray, Ron Fellows, Elliott Sadler and six others. McMurray posed a win for the team that season. In 2011 Eury led Aric Almirola full time. They posted seven Top 5 finishes and finished fourth in points. It would prove to be the final full time season for Eury. In 2012 and 2013 Eury headed up teams for 15 races. Over that span the drivers collected five Top 5 finishes. For his career Eury has 15 Cup wins including the 2004 Daytona 500. He also had 29 Xfinity series wins. Elliott would drive for him. The team would also be the cornerstone for Dodge's return to Cup racing in 2001. Before the 2001 Cup season, a Dodge had not raced in the series since Phil Good at the Pocono Raceway in June 1985. Evernham led Dodge's return to NASCAR by fielding two full-time cars in the 2001 season. Bill Elliott was named to drive the No. 9 Dodge Dealers/UAW Dodge on March 10, 2000. The driver of the No. 19 Dodge Dealers/UAW Dodge was announced to be Casey Atwood. In the last race of the year Bill Elliott claimed Evernham Motorsports first win in the Homestead 400. In 2002, Jeremy Mayfield was added to Evernham's program, taking over the No. 19 Dodge from Atwood. In 2002, Evernham found success with his new program by witnessing Mayfield win the Winston Open, as well as Bill Elliott winning back to back in the Pennsylvania 500 at Pocono and The Brickyard 400 at the Indianapolis Motor Speedway. In 2003, Elliott ran strong with several 2nd place finishes and won the next to last race at North Carolina Motor Speedway at Rockingham and nearly won the season finale at Homestead, cutting a tire while leading on the last lap, surrendering the lead and win to Bobby Labonte in Elliott's last full time race. In 2004, Kasey Kahne took over the 9 car with Elliott running part time in a third car, number 91 and Mayfield in the 19. In 2006, Jeremy Mayfield was fired for "lack of performance" and for comments detrimental to the team. In August 2006 Elliott Sadler was announced as the new driver of the 19 car. 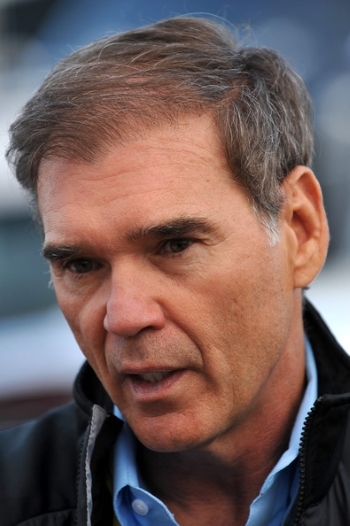 Court documents reveal that Mayfield blamed Evernham's personal life, included a claim that a "close personal relationship" had developed between the then-married Evernham and development driver Erin Crocker, and "sub-par" equipment as the reasons he has not won a race in 2006. Evernham admitted that he had an ongoing relationship with Crocker. Furthermore, he said about Crocker, "The proper thing to do and something her and I would like to do is move her to another race team." Evernham and Crocker eventually were married at a private ceremony in Las Vegas on August 26, 2009. Evernham has dipped into television several times as an analyst. He has worked three separate stints for ESPN/ABC: in 2000, 2008–2010, and 2012–2013. He has worked both race coverage and studio coverage at various points. Evernham also hosted the show AmeriCARna on Velocity. Evernham also worked on NBCSN as a color analyst and is paired up with Ralph Sheheen on broadcasts of the Whelen Modified Tour and Whelen Southern Modified Tour. 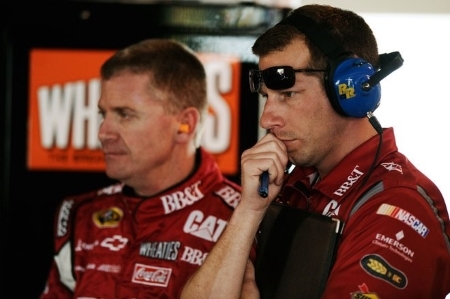 to be the crew chief for young Kurt Busch in 2002, and Ben Leslie became the crew chief for Mark Martin. The swap was a success as Busch won the NASCAR Cup Series title in 2004. It was the first year of the Chase for the Cup. Busch dedicated his title to Fennig. 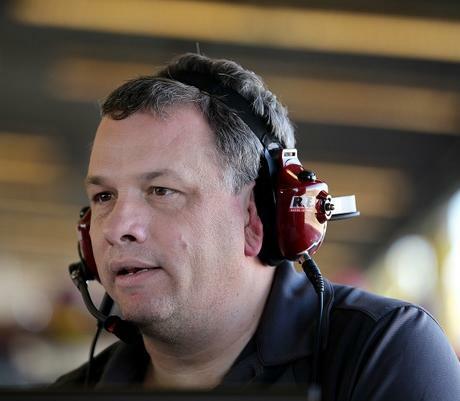 Fennig was named the Sporting News crew chief of the year. He continued in that role until 2006. Fennig became the crew chief for David Ragan after Ragan replaced Martin in the #6 car in 2007, and he remained in that role for 2009; only posting eight Top 5 finishes over that three year span. Fennig was then paired up with Matt Kenseth in 2010. They had some success claiming eight wins over the next three seasons and made the Chase each year. In 2013 Kenseth left Roush Racing to go to Joe Gibbs Racing, and Fennig became the new crew chief for Carl Edwards. They got two wins, and made the Chase, but the team had back luck and mechanical issues relegating Edwards to 13th in the points. Fennig/Edwards paired together again for the 2014 season. They won twice and had seven Top 5 finishes. Edwards could only finish ninth in the points. 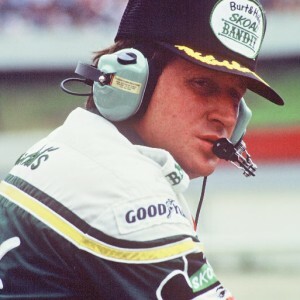 So far in his career, Fennig has 40 wins with five different drivers. Some more notable wins include the 1988 Daytona 500 with Bobby Allison; 2012 Daytona 500 win with Matt Kenseth, and 2004 Cup Championship with Kurt Busch. His drivers have finished in the top five in points seven times. full-time in 2006 winning the Budweiser Shootout, and sweeping both races at Pocono. 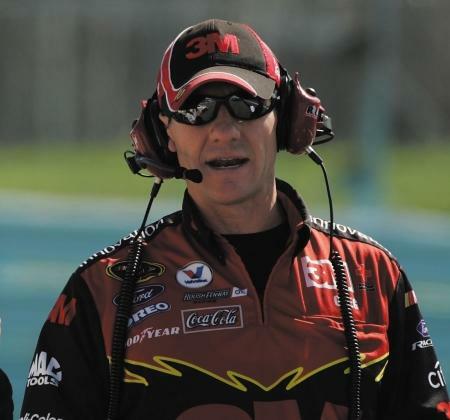 As crew Chief of the #11 car Mike Ford won 17 races including eight wins in 2010 and finished second in the points. On Dec 6th, 2011 Joe Gibbs Racing released Ford. On April 30, 2012, he replaced Greg Erwin as crew chief for the #43 Richard Petty Motorsports Ford, driven by Aric Almirola, for the rest of the 2012 season. In September 2012, Richard Petty Motorsports announced changes to its crew lineup. Ford became the new crew chief for the #9 Ford, driven by Marcos Ambrose, while Ambrose's crew chief, Todd Parrott, would become the new crew chief for the #43 Ford. In October 2012, Richard Petty Motorsports announced that Ford was no longer with the organization and was replaced by Drew Blickensderfer at the #9 Ford. In December 2012, Ford was hired to act as competition director for BK Racing. 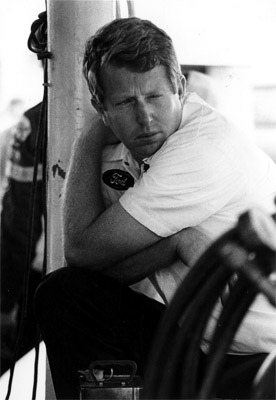 For his career Ford was crew chief in 14 seasons. He had 21 wins; four with Bill Elliott, and the rest with Denny Hamlin. Along with heading up Elliott's Brickyard 400 win, he also led Hamlin to a win in the Southern 500 in 2010. From 2014-2016 he was crew chief part time in each of those season heading up the efforts of owner Tony Townley; Father of John Wes Townley and co-founder of the Zaxby's restaurant chain. Over that span they ran 32 events and posted one Top 5 finish. Ford returned to a crew chief role for the 2016 Daytona 500 with BKR, working as Robert Richardson, Jr.'s crew chief; to date his last start. Rick Mast at Butch Mock Motorsports. After one year working with the team, Francis was hired by Robert Yates Racing to work on Dale Jarret's team. During the season, his team won four races, as well as the 1999 NASCAR Cup Series championship. He remained with the team until the end of the 2000 season. During the season, his team won four races, as well as the 1999 Cup Series championship. He remained with the team until the end of the 2000 season, when he was offered to become the team engineer at Evernham Motorsports for Bill Elliott. 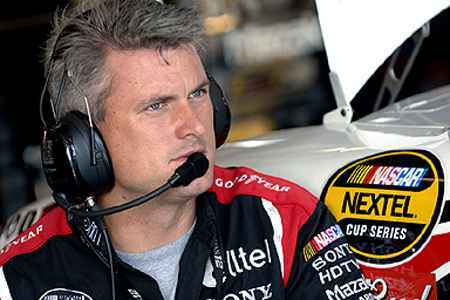 He became a crew chief for the first time in the 2003 season, he was promoted and became the crew chief and team director for Jeremy Mayfield. By the 2004 season, Francis helped the team to make the Chase for the Cup Championship in its first year and win a race. In 2005, he only sit atop the pit box on four occasions. During the following season, he became the crew chief for Kasey Kahne and got a win at Atlanta Motor Speedway in the spring. At the end of the season, his team was able to record six wins and finish eighth in the points. Francis and Kahne failed to win a race, as George Gillette became part owner in 2007. During 2008, Francis continued to work with Kahne, and won two races: the Sprint All-Star Race and Coca-Cola 600. Afterward, Richard Petty became partial owner of the team, renaming it to Richard Petty Motorsports. During the season, they again recorded two wins, and finished tenth in points. In 2010 Kahne decided to leave Richard Petty Motorsports to race for Red Bull Racing Team; Francis decided to follow Kahne where they visited victory lane once during their tenure at Red Bull Racing. For the 2012 season, Kahne moved to Hendrick Motorsports. Still with Francis, Kahne won two races and recorded a career best fourth place finish in the final points standings. As the 2013 season closed Kahne collected two more wins, and once again made the Chase. In 2014 the duo would once ago win once. After 2013 Francis assumed the new position of vehicle technical director at Hendrick Motorsports. It ended the streak of being the crew chief for Kasey Kahne since the final race of 2005 and worked with Kahne at three different organizations. As 2015 rolled around and Chase Elliott joined Rick Hendrick Motorsports; Francis became the new young drivers crew chief for the five races he ran. In 2016 Francis would crawl atop the pit box for the final time as of 2018 at Loudon NH. Chase Elliotts regular crew chief had been suspended for one race after a post-race infraction after the race at Chicagoland. Alan Gustafson had made every single start in the Cup Series as crew chief for Hendrick since the 2005 Daytona 500 (459 races ago). Sunday's race at Loudon was the first race he'd ever missed in his 13th season as crew chief. For his career Francis has led his drivers to 17 Cup wins; including the Coke 600 three times; 2006, 2008 and 2012.
owner Gene Haas who fielded a series of drivers that season. John Andretti, Ward Burton, Jason Leffler and Jack Sprague all raced for Haas; and none of them posted a single Top 10 finish. He led Ward Burton in 2004 for 18 races and had two Top 10 finishes in the first 18 races, before being let go and replaced by Billy Ingle. 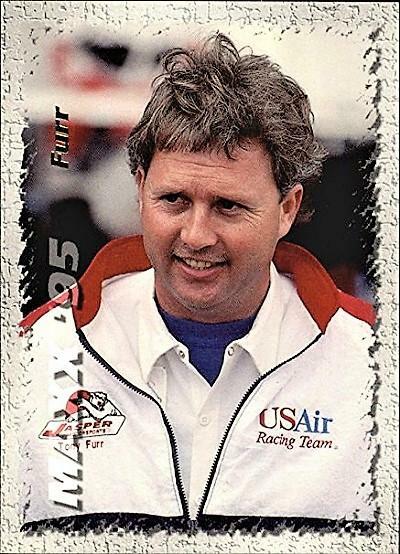 Furr stepped down to crew chief in the Truck series in 2005 for owner Tom Eldrege and driver Todd Bodine; before moving after just nine races to work for owner Jeff Wyler and driver Jack Sprague. He posted two Top 5 finishes with each driver. In 2006 and 2007 he stayed with Wyler / Sprague and they won two events in 2006 and added another in 2007. 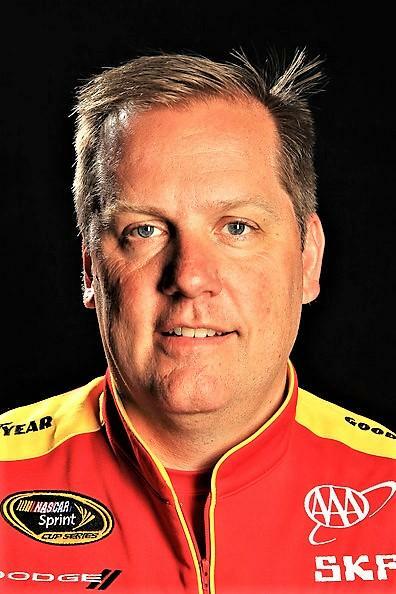 He was on the sidelines in 2008; but in 2009 Jeremy Mayfield had started his own team and he hired Furr for five events where they did not show any decent results. 2010 again saw him on the sidelines; but in 2011 he went to work for owner Dusty Whitney opening the season with JJ Yeley. The owner seemed to be more of a start-n-park as all of Yeleys finishes were 37th or worse. Scott Speed also started ten races and had a best finish of 33rd. Bill Elliott ran one race (Talladega) and finished on the lead lap; albeit in 23rd spot. Yeley and Furr moved in 2012 to work for owners Robinson-Blakeney Racing. Again they posted poor finishes with a best of 33rd. They did attempt to run the full races; but had mechanical issues in 16 of their 20 races. Furr worked with Scott Riggs in 2013 for three events; before not calling the shots for anyone until 2017. 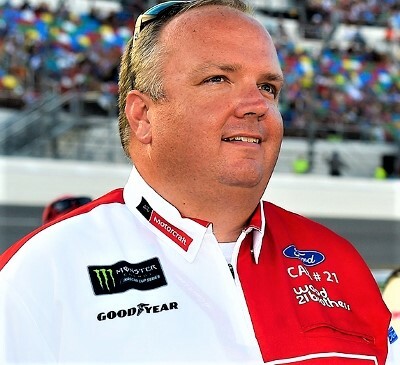 Owner Rick Ware hired Furr to led a hand full of drivers in 2017. A under funded team; Ware didn't have the fire power to be competitive with the top teams and only qualified for 29 races. His drivers posted a best finish of 32nd. Late in the 2017 season Furr was hire by StarCom Racing for the final two races. For 2018, Tony Furr had a rough season. Calling the shots for a bevy of drivers on underfunded teams; he and nine different drivers paired up and struggled mightily. In race race that saw the yellow flag fly ten times for crashes; driver JJ Yeley was able to produce a season high 17th place finish. Furr's drivers only had two other finishes of 20th or better all of 2018. StarCom has purchased a Charter for the 2019 season, and Furr and Landon Cassill should pair up full time for them in 2019. CHRIS GABEHART - 5/16/1981 - Gabehart first became a NASCAR crew chief in 2016. 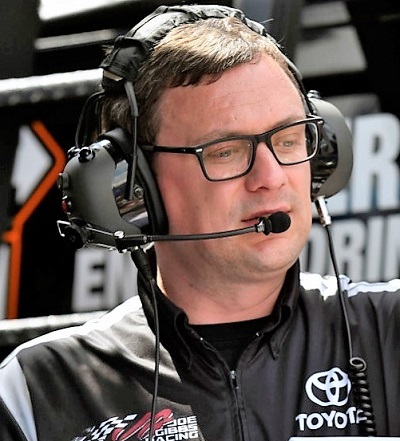 He hired by Joe Gibbs and paired with Erik Jones to run the full Xfinity series season. The duo found victory lane four times and finished fourth in the points. In 2017 Jones went full time Cup racing and Joe Gibbs fielded a car that featured a variety of drivers. Jones won 17 of the 33 events and make it to victory lane three times. Gabehart also posted wins with Denny Hamlin and rookie Ryan Preece. Preece made three starts and along with his win he also finished second and fourth. Overall his drivers posted five wins, 17 Top 5's and 18 Top 10's. Also in 2017 he made his first start as a Cup crew chief. It came as he led Denny Hamlin when his regular crew chief had to serve a once race suspension and Gabehart filled in. The duo finished fifth at Richmond. For 2018 Gabehart was paired with Brandon Jones full time running the Xfinity series events. Jones had a best finish of second; but did make the Chase via points. He advanced through the first round; but was eliminated at the end of round two. For 2019, Gabehart is again going to be united with Hamlin at the Cup level. He will lead the efforts of Hamlin full time as they both back on the winning track as they both went winless in 2018. Chicago. For the season the drivers collected seven wins; while having 17 top five and 23 top tens. 2016 saw a variety of drivers work with Gayle. A total of nine different drivers would wheel the #18 car with Kyle Busch at the controls for 17 races; and Matt Tifft ran seven events. Busch would again win at Indianapolis. The other drivers only ran one or two events. Busch had a phenomenal season as he would park his car in victory lane ten times in his 17 starts. Denny Hamlin and Sam Hornish would also add one win each. They produced 19 top five and 23 top ten finishes. In 2017 Erik Jones moved up to the Cup series full time; and he was paired with Gayle. The rookie didn't get a win but did almost claim a win when he finished second at Bristol. 2018 was a break through year for Gayle and his driver Erik Jones. In July at Daytona, Jones was able to pull off the first Cup win for both of them. Jones only led one lap as he passed Martin Truex in the second over time. The race was a crash filled affair that saw 20 cars crash out. Jones also finished second at Indianapolis and had a total of nine Top 5 finishes. They had 18 Top 10 finishes, but after two bad finishes in the first round of the Chase Jones was eliminated. He ended up 15th in the points. 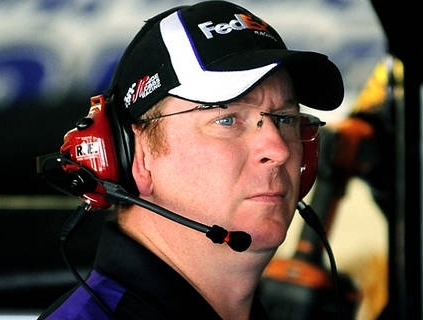 Chris Gabehart will take over for Mike Wheeler as Denny Hamlin‘s crew chief in the Cup Series in 2019. At this point in his young career, Gayle has one cup win, along with an additional 20 Xfinity victories. 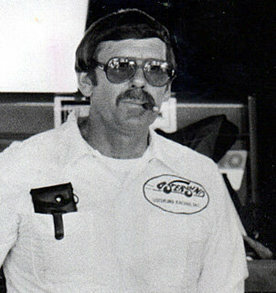 mechanic on Kulwicki’s team in 1986. Gibson worked as car chief on Alan Kulwicki’s title team in 1992. Gibson got his first shot at being a crew chief in 1994. He worked for owner Charles Hardy (from my home town of Gainesville GA) as Hardy fielded a car for Jimmy Hensley. Bobby Hillin and Kenny Wallace for a total of six events. Wallace posted a ninth place finish. He led Bill Elliott for 20 races in 1995 where he posted three Top 5 finishes. Hendrick Motorsports hired Gibson to head the #24 car with driver Jeff Gordon. Serving as car chief for Gordon the combination recorded 29 victories, winning a Cup title in 1998 and in 2001. Gibson moved to Dale Earnhardt Inc. in 2002 where he worked various roles. 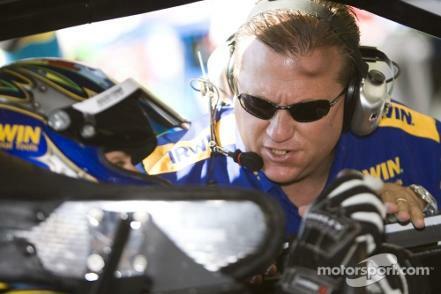 As a crew chief he worked with Steve Park in 2003 and later with Michael Waltrip in 2005. 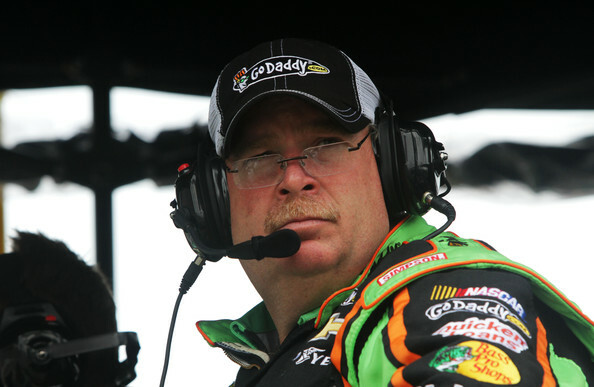 He moved to the car chief position for Dale Earnhardt, Jr. in 2006 and later worked as his crew chief for 11 races in 2007. Gibson moved over to Dale Earnhardt Inc.’s #8 Chevrolet, in 2008, driven part time by Mark Martin and rookie Aric Almirola. In 2009, a new race team, Stewart-Haas Racing, created by Tony Stewart hired Gibson to lead the #39 of Ryan Newman. A decision to pit for just 2 tires led to his first victory with Newman in 2010 in the Subway Fresh Fit 600 at Phoenix AZ. Gibson and Newman teamed to two win one race again in 2011 and 2012. In 2013 Danica Patrick moved up to the Cup series also racing for the Stewart-Haas stable. Gibson moved over to help the young rookie driver. Success came immediately as Patrick became the first woman ever to win a pole position, and it came at the very first race of the year at Daytona. Patrick ran a great race, and was running in the top five when the white flag flew. She ended up eighth; her best finish of her rookie season. For 2014 Gibson and Patrick teamed up again but with three races to go in the season the owners decided to swap the crew chiefs of Patrick and Kurt Busch; so Gibson was sent to Busch and Daniel Knost came to lead Patrick. Knost remained with Patrick for 2015; while Gibson led Kurt Busch to two wins and 10 Top 5 finishes. Kurt Busch went win-less in 2016; but in 2017 Gibson had the day of his life as Busch pulled off the win in the 2017 Daytona 500; Gibson's home town. In 2018 Gibson made a career move within the Stewart-Haas organization. Gibson stated he "had been trying to come off the road for several years. Traveling 4 days a week for 31 years can take a toll on you. For 2018, Stewart-Haas Racing gave me the opportunity to come off the road and still have a very hands-on job within the organization. Working closely with all four crew chiefs and NASCAR". Billy Scott was the replacement for Gibson and driver Kurt Busch in the #41 car. wins over the next two seasons. 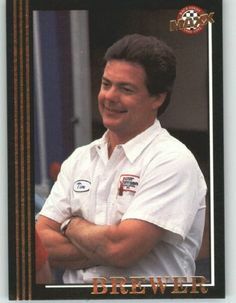 Late in the 1996 season, Glover was let go from Morgan-McClure and joined SABCO Racing to serve as team manager and crew chief for rookie Robby Gordon. Shortly into the 1997 season, Glover left his crew chief post to focus on his team manager duties. He reunited with Marlin, who joined SABCO, in 1998 for a few races as interim crew chief. After a short stint as co-crew chief of Marlin's car with Corrie Stott in 1999, Glover became permanent crew chief of the #42 SABCO entry driven by Joe Nemechek. Together, they earned three pole positions and Nemechek's first Cup victory at New Hampshire International Speedway. Glover served as crew chief for Nemechek's replacement for the 2000 season, Kenny Irwin, Jr., until Irwin suddenly died during practice at New Hampshire. He remained as crew chief for the rest of the 2000. He did not serve as crew chief for a team again until late 2004, when he rejoined Marlin's team. 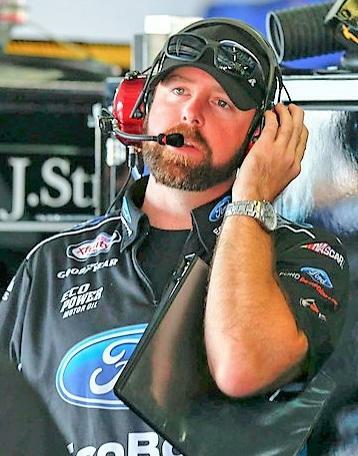 Glover did not hold a crew chief position again until 2012 when he was hired by Circle Sport to serve as crew chief for rookie drivers Stephen Leicht and Cole Whitt. Glover left the team at the end of the season. Glover got 14 wins as the leader of his teams; seven times with Ernie Irvan, six with Sterling Marlin, and the final one with Joe Nemechek. Notable wins include winning the Daytona 500 three times. Once with Irvan (1991), and twice with Marlin (1994 & 1995). 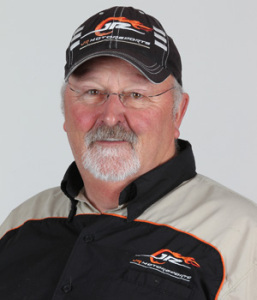 In 2013 Glover was been named technical director for the NASCAR Touring Series and NASCAR Research and Development. drivers: Sam Hornish and Kurt Busch. He replaced Steve Addington, who moved to Tony Stewart’s championship team at season’s end. Gordon visited victory lane for the first time with Keselowski at Kentucky Speedway. They would add four additional victories that season. He would also win once with Busch and Hornish. 2012 saw him move up to the Cup Series and work with AJ Allmendinger for the first 17 races. He was swapped to work with Hornish the second 1/2 of that season. He posted one Top 5 finish with each driver. Penske hired Joey Logano in 2013 and paired him with Gordon. Gordon got his first Cup win at Michigan when Logano won both the pole and the race. The following season Logano would visit victory circle on five occasions and finish fourth in the points. The following season was even better as they duo won six times; including the season opening Daytona 500. However they were only able to manage a sixth place finish in the points. In 2016 Logano would post three wins and 16 Top 5 finishes. He got edged out by three points in the Championship race as Johnson won the title. 2017 saw Logano get off to a good start finishing in the top 6 in eight of the first nine races; including a win at Richmond. But Logano failed post race inspection and it was ruled "encumbered". He'd have to win again or make the Chase via points. After that win Logano took a major down turn and finished 21st or worse the next six races and eventually missed the Chase. As 2018 dawned Penske kept the pair together thinking there was more success to be had. 2018 saw Gordon and Logano reach the pinnacle of success. Logano only posted three wins this season but they came at the right time. First he won early in the season to lock them into the Chase. He managed to run well and make it through the firs two rounds. In the third round; Logano "moved" Martin Truex on the last turn, last lap to get the win and lock himself into the season's final race and a shot to win the Championship. He had a good short run car; and as luck would have it; a late race yellow set up a short run to the checkers. Logano bypassed the leaders quickly and went on to get the win and claim the Championship. Gordon and Logano will try to defend their title in 2019.
had been Edwards crew chief). Five races into the season, Rogers announced he was stepping away from his crew chief duties and taking a personal leave of absence. Scott Graves took over on top of the pit box for the #19 Monster Energy NASCAR Cup Series team. When Rogers decided to leave, Suarez had posted two Top 10 finishes in the seasons first five races. With Graves at the helm the remainder of the year Suarez was able to record one Top 5 and ten Top 10 finishes. Gibbs decided to leave the pair together for 2018. The duo did have one second place finish at Pocono and a total of three Top 5's; but overall was a disappointment. With only nine Top 10 finishes on a team where the rest of the drivers made the Chase. At the end of the season Suarez was let go, while Graves left to go to work for Roush Fenway Racing and call the shots for new Roush driver Ryan Newman. Haas Racing team to serve as Tony Stewart's crew chief in 2009. 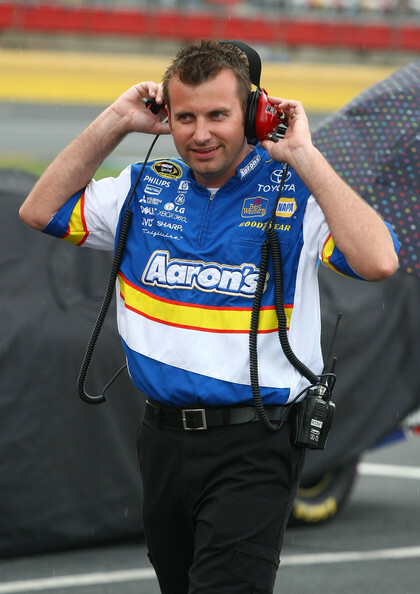 Grubb was the winning crew chief for Tony Stewart in the 2009 All-Star race at Charlotte. Grubb also guided Tony Stewart to his first win as an Owner, Driver of a points paying race. The race was won at Pocono Raceway in the Spring of 2009 and was won on fuel strategy. During the 2011 season, Grubb led Tony Stewart from a mediocre pre-chase effort to five chase victories and Stewart's third NASCAR Championship. This was Grubb's first championship. However, Grubb announced that he had been informed of his release prior to Charlotte and would be leaving Stewart-Haas at the end of the season no matter the outcome. Grubb became the crew chief for Denny Hamlin and the No. 11 team in 2012, replacing Mike Ford. The pair recorded five wins in 2012 and finished sixth in the points. 2013 was a tough year for Grubb as Hamlin crashed on the final lap of a race at Fontana CA while fighting for the win. Hamlin broke his back; but would refuse surgery and only miss four races. It was a gutty performance by Hamlin, but he clearly wasn't at 100% until late in the year. On the final race of the season Hamlin broke through and found victory lane at Homestead-Miami Speedway. This kept alive a streak few crew chiefs enjoy as having earned at least one win every year they have been a crew chief (even counting the four race stint for Johnson). In 2014 Hamlin again worked with Grubb and they posted one win; finishing third in points. Grubb was moved to work with Carl Edwards in 2016, who had moved to Joe Gibbs Racing from Roush Racing. They won two major events that season; claiming victory at the Coke 600 and later at Darlington in the Southern 500. In 2016, Grubb returned to Hendrick Motorsports to become the vehicle production director, which oversees chassis manufacturing. In 2017, he was named crew chief for the #5 car of Kasey Kahne for the last 9 races of the season starting at New Hampshire. 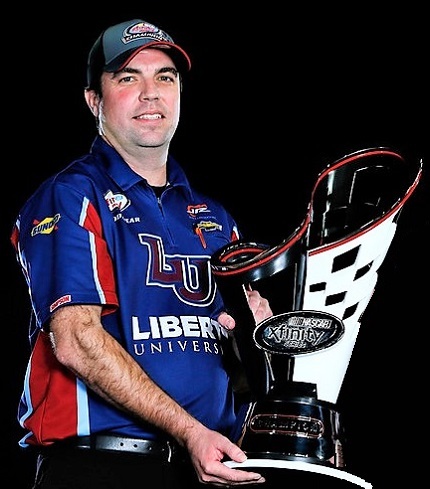 On November 1st, it was announced that Grubb will be the crew chief for William Byron for the 2018 NASCAR Cup Series season. After having such great success in both the Truck series and Xfinity series William Byron moved to the Cup series in 2018 with great aspirations. He was paired with crew chief Darian Grubb who had shown great success as a Cup chief. The season saw Byron have growing pains as he struggled to adapt to the faster, more high powered Cup cars. The duo only had four Top 10 finishes, with a best of sixth at Pocono. For 2019 a major surprise was announced as owner Rick Hendrick split up the seven time Championship pairing of Chad Knaus and Jimmie Johnson. Knaus was moved over to call the shots on Byron's car in 2019. As of this moment it is unknown what Grubb will do for the upcoming season. To date Grubb has 23 Cup wins including: The two wins as a temporary chief for Johnson; one race win with Casey Mears (Mears only career win); 11 wins with Tony Stewart, and six with Denny Hamlin. Notable wins include Daytona 500 (2006) ; Coke 600 (2007 and 2015) and Southern 500 (2015). Letarte was moved to Dale Earnhardt, Jr.'s #88 team in turn. Over the course of the 2011 season, Gustafson helped Gordon get to victory lane three times at Phoenix, Pocono, and Atlanta. In 2012 Gordon won twice, and in 2013 the duo won again. During this span Gordon passed Cale Yarborough, Bobby Allison and Darrell Waltrip to move up to third in the all time Cup wins list. As 2014 kicked off Gustafson and Gordon had a good season with Gordon winning four times and finished sixth in points. 2015 would be Gordon's last full time season and he and Gustafson would win very late in the season to qualify him for the Chase. Kyle Busch would win the final race at Homestead and the Championship. Gordon finished third in the points. After Gordon's retirement Alan was paired up with a young Chase Elliott with plans of great things happening. Elliott had a great rook season finishing second twice and had ten Top 5 finishes. He won Rookie of the Year; but there was disappointment the rookie had not won a race. In 2017 Elliott again had a good season; this time he had 12 Top 5 finishes; but again failed to win a race. He had five second place finishes. For 2018 the Elliott / Gustafson combo plans on breaking through for their first win. After five second place finishes in 2017; Chase Elliott was due to get his first Cup win; and Gustafson was ready to lead him to it. A great pit call got Elliott out in the lead at Watkins Glen; and great driving Elliott saw the youngster grab his first win. The pairing went on to win two more times before the season ended. Chase made it to the final round of the Chase but contact with Kurt Busch and Denny Hamlin eliminated him from running for the Championship in the final race. The pair are supposed to be back together for 2019. So far in his career Gustafson has gotten 23 wins; notable among them the Southern 500 (2009) and BrickYard 400 atIndianapolis (2014).